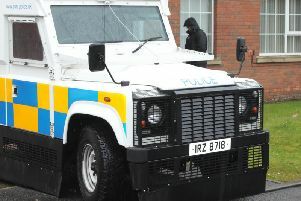 A thief driving under the influence has crashed a stolen vehicle as he fled from the scene of a robbery in Portadown. The hapless burglar stole the car from a house on the Derryanvil Road on Saturday. Police say they were able be apprehend him thanks to a tip off from a member of the public. The suspect, who has been charged with driving whilst unfit, aggravated taking and driving away, driving with no insurance or license and burglary, was arrested after being checked out of hospital and remains in custody. Craigavon police thanked the public on social media. “This arrest was made possible because of a call from a member of the public. Too often recently we’ve heard people AFTERWARDS saying that they saw something suspicious, but didn’t see fit to phone us,” said a spokesperson. The burglary was one of a spate of house break-ins across the Craigavon, Banbridge and Armagh areas on Saturday. In the afternoon, a house was broken into in Acton Village. Reports were also received of a suspicious Grey/Metallic SAAB with 4 males on board wearing hi-viz jackets within the same time period within Brannock Meadows, Poyntzpass. Later a house on Rathfriland Street, Loughbrickland was broken into, and a house at Barban Heights, Dromore was also targeted. The police have asked for anyone with information on any or these incidents to call on 101.